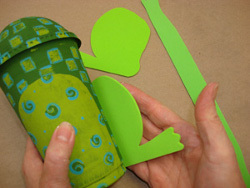 Recycle your plastic cup after enjoying a cool, frothy drink by making this Eco Froggy Bank from Heidi Borchers. 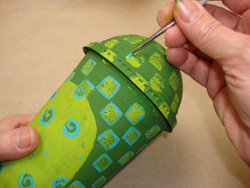 Create this recycled craft instead of throwing away your used cup. All you have to do is rinse it out - be sure to save the domed lid! Wash and dry plastic cup. Pour paint on to waxed paper. 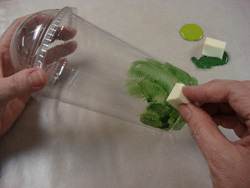 Dab cosmetic sponge into paint and dab onto plastic cup. Let first coat dry and then apply second coat. Trace stomach pattern onto front of cup. 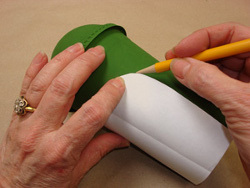 Fill in inside the pattern line with lime green acrylic paint. 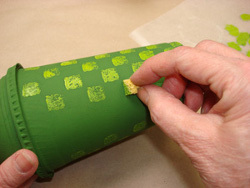 Cut pop-up sponge into small square shape. Dip in water to pop-up sponge. Wring out all excess water. 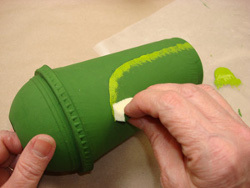 Dab into lime green paint and press onto cup in desired pattern. Using liner brush, draw line around stamped squares and draw swirls on front. Cut tongue from fun foam. Determine placement of mouth line. 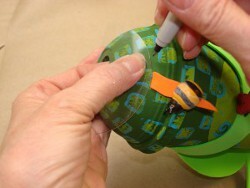 Cut hole in lid with craft knife and carefully press tongue into hole. Glue wooden embellishments into place. Trace mouth pattern onto lid of cup. Cut strip of black craft foam and glue in place over pattern line. 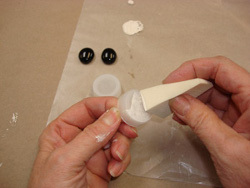 Paint water bottle caps white using cosmetic sponge. Let dry. 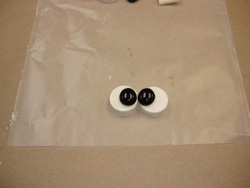 Glue caps together to create eyes and glue marbles in place on top of caps. Let glue dry completely. 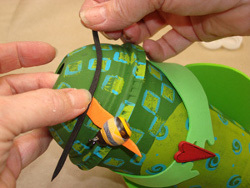 Glue eyes to top of lid. Let dry completely. 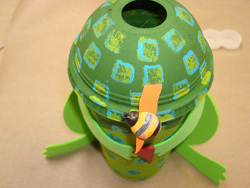 The kids can drop their coins in the top of the bank and can remove the coins by removing the domed lid from the plastic cup. 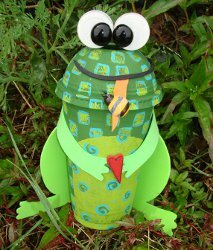 For a comprehensive video tutorial, check out How to Make an Eco Froggy Kids Bank.